The portfolios of Pacific Ridge's graduating visual artists were celebrated on Thursday, May 14th, with a reception and exhibit in the Arts & Technology Center. 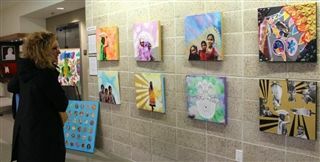 Families and friends viewed the artwork and discussed its inspiration and creation with each of the artists. "This year's senior art show was a resounding success," said photography teacher Alison Behr. "Our visual and digital arts programs continue to thrive, and it was nice to celebrate with an event that featured more senior artists than ever before, a brand new venue, and an impressive turnout. We hope these seniors continue their excellent creative work in college and beyond."